Extremely helpful and nice staff. Rooms are clean. Location to downtown is great. Beautiful hotel right in the middle of the city. The room was outstanding and Silvio at the front desk was absolutely awesome! Would definitely stay here again. The room was nice and spacious and the bed was very comfortable. Lovely hotel with helpful staff and excellent location. The hotel was clean and spacious with a kitchen, cookware, and a storage closet. They also provided bottled water and other amenities. Had to cancel reservations and book a different hotel because the room was not ready and they made guests wait. Front of the hotel is under construction so it was hard to find and park. Booked the room for the rooftop pool. Get there and find out it is closed! Very disappointing that the reason I chose the hotel and it is closed and not listed on the website. 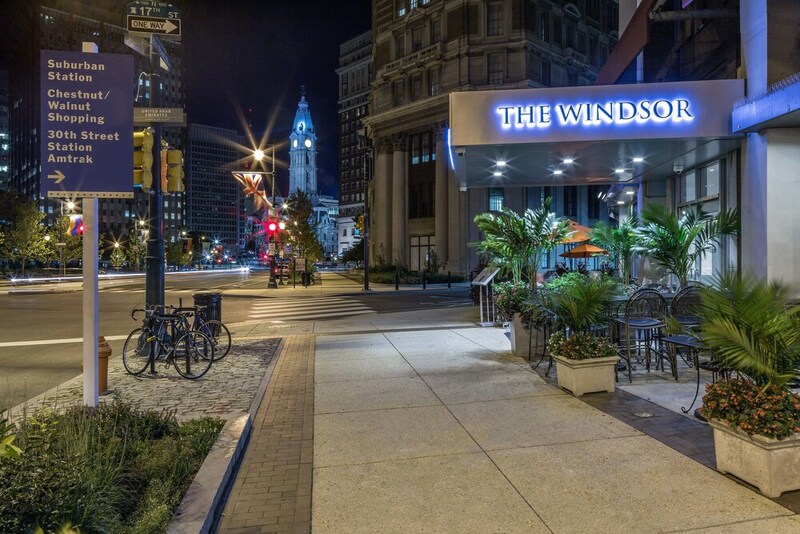 Located in Center City, The Windsor Suites is within a 5-minute walk of Academy of Natural Sciences and within 15 minutes of other popular attractions like Pennsylvania Convention Center. This 195-room, 4-star hotel has conveniences like an outdoor pool, a 24-hour fitness center, and free in-room WiFi. This hotel is home to 2 onsite restaurants, perfect for a quick bite to eat. Savor a meal from the comfort of your room with room service. For your convenience, a full breakfast is served for a fee on weekdays from 6:30 AM to 10:00 AM and on weekends from 8:00 AM to 10:00 AM. Guests can expect to find free WiFi and 32-inch an LCD TV with cable channels. Pillowtop beds sport premium bedding and the bathroom offers a hair dryer and free toiletries. Other standard amenities include a kitchen, a refrigerator, and a microwave. Guests staying at The Windsor Suites enjoy an outdoor pool, a 24-hour fitness center, and free WiFi in public areas. Valet parking is offered for USD 42.00 per night. The 24-hour front desk has multilingual staff ready to assist with luggage storage, dry cleaning/laundry, and securing valuables. Additional amenities include a 24-hour business center, a computer station, and express check-out. Thank you for the 5 stars, we hope to see you again! Thank you for the 5 stars, we hope you enjoyed your stay! Thank you for the 5 stars, thank you for choosing to stay at The Windsor Suites! Thank you for the 5 stars and feedback, glad you enjoyed your stay. We are thrilled to hear that our overnight guard was able assist on travel arrangements. We hope to see you again! Thank you for the 5 stars, thank you for choosing to stay at the Windsor Suites! We hope to see you again! Thank you for the 4 stars, we hope you enjoyed your stay! Thank you for the 5 stars and feedback. Glad to hear you enjoyed your stay! We hope to see you again! Thank you for the 4 stars and feedback. Glad to hear you enjoyed your stay! We hope to see you again! Thank you for the 4 stars and for choosing to stay at the Windsor Suites! Full breakfast is served on weekdays from 6:30 AM to 10:00 AM and on weekends from 8:00 AM to 10:00 AM for a fee. Recreation features at The Windsor Suites include an outdoor pool and a 24-hour fitness center. Debit cards aren't accepted. Prepaid debit cards are not accepted for any bookings or onsite payments.